For many, getting between Bend and Portland has historically been a less than glamorous trip. You can take the bus, if you don’t mind inflexible schedules and close quarters. You can drive, if you don’t mind potentially dicey weather. You can even fly, if you don’t mind spending a lot of money. Or, you can take Mt. Hood Teleporter shuttle service. Designed to “transcend traditional travel”, Mt. Hood Teleporter has a fleet of luxury shuttle buses that make traveling comfortable, entertaining, and relaxing. Sit back in your heated, massaging captain’s chair and take advantage of the free Wi-Fi. Didn’t bring a device? Mt. 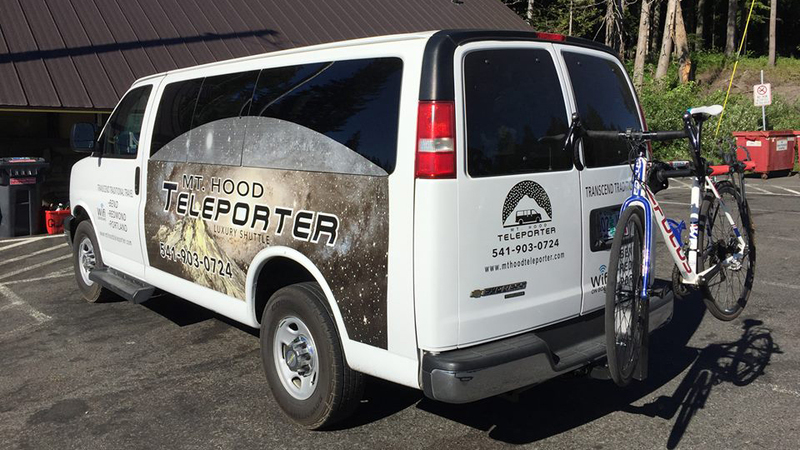 Hood Teleporter will happily loan you one of their Amazon Fire tablets for the ride. Snacks and drinks are provided and, when time allows, you will be dropped off at the destination of your choosing. And, each luxury shuttle holds a maximum of seven passengers, so you’ll always have plenty of room to stretch out, without getting up close and personal with your neighbor. Round trip and one-way fares are available and are less than the competition. Make the Portland/Bend trek in style with Mt. Hood Teleporter.